Every year, Nippon Ichi Software holds an internal event encouraging all staff to come up with ideas for a new game, with one such submission guaranteed to get picked up for development and eventual release. It’s an avenue expressly designed to encourage creativity and to involve staff not usually involved at the conceptual stage; as a result, it’s an outlet for more experimental games that wouldn’t necessarily make it through the usual greenlight process. Unsurprisingly, it regularly delivers some of Nippon Ichi’s best work—htoL#NiQ: The Firefly Diary and Yomawari: Night Alone, each a brilliant game in its own right, both stem from this initiative. The Liar Princess and the Blind Prince is the latest such masterpiece. Deep in a dark forest lives a wolf. She’s your regular man-eating wolf, for the most part, but every night, she climbs to top of a cliff and sings to the moon. This song enough to entice a young prince out from the safety of a kingdom in the middle of the forest—a tasty morsel for a hungry wolf. But when the prince—who, from the bottom of the cliff, can’t see the wolf behind the singing—applauds, the wolf hesitates. Night after night, the prince comes back to listen to the song, with the wolf always looking forward to hearing his applause. Then, one night, the prince climbs the cliff to find the source of the beautiful voice. The wolf panics—she can’t let the only person who’s ever appreciated her song see her monstrous form! She tries to shield the prince’s eyes, but accidentally mauls his face in the process. Some days later, the guilty wolf sneaks into the kingdom to see the prince. His eyes are bandaged up, and his once-regal clothing is replaced with tattered rags—with his newfound blindness, he’s brought shame on the royal family and been locked away in a cell. But to hear the wolf’s voice brings a light to his life; it’s a voice he’d recognize anywhere. When he asks who she is, the wolf panics again and tells a little white lie: “I’m a princess from a nearby kingdom”. Desperate to make things right, she suggests visiting the forest’s resident witch to make a wish, but the blind prince would need a hand to guide him, and the wolf has only “sharp claws that were made for hurting others.”. After telling the prince to hang on for a little bit longer, the wolf rushes back into the forest to consult the witch. “I wish to become a human!” “You do know what I need, yes? The most beautiful hearts are the ones willing to lose what’s important to them in order to get what they want.” “…Okay, I’ll give you my singing voice in exchange!” A swirl of magic, and the wolf’s song is taken, sealed away in a bottle to join countless other such prizes in the witch’s home. But the wolf was now a beautiful princess, and in a bid of extra help, the witch has given her the power to shift between wolf and princess forms at will. This sets in motion the central concept of The Liar Princess and the Blind Prince: you, as the wolf princess, need to guide the blind prince through the forest’s myriad dangers to the witch’s house. In wolf form, the liar princess can fight monsters, push rocks around, and jump higher than a person ever could; in princess form, she can take the prince’s hand and guide him forward. Making use of both powers is the key to solving the puzzles that stand between the two young royals and the witch. Early on, the prince is—understandably—too scared to move without the gentle, guiding hand of the princess. But as their time together ticks along and he slowly regains his confidence, he’s able to undertake simple tasks at the princess’ command: walking short distances, and picking up and carrying small objects like lanterns. These simple mechanics allow for some creative puzzles. You’ll be guiding the prince to a pressure plate, rushing to jump onto the lift that it activated, and then figuring out how to get the prince up there to join you. You’ll be escorting the prince onto a moving platform, then shifting between wolf and princess forms to fend off monstrous bats and squeeze under outcrops too low to let the wolf through. You’ll be looking for your light for the prince’s lantern and trying to get to the next brazier before the light runs out, and sometimes that won’t be enough; you’ll be thrown into the darkness, left to trust the level designers, as you blindly move forward, in the same way the prince trusts you. Trust is at the heart of The Liar Princess and the Blind Prince. The prince trusts the princess, to the point that, at her command, he’ll blindly inch his way across a flimsy makeshift bridge. The princess depends on the prince’s trust—it’s the only way she can help him—but knows she’s not worthy of it. With trust comes the responsibility of living up to that trust, and that means making amends when you break that trust. The wolf broke the prince’s trust when she injured him—she didn’t intend do, but the traumatic consequences are the same regardless of intent. In her desperate effort to “fix” things—which is to say, to protect herself from the possibility of the prince, quite understandably, wanting nothing more to do with her—she damages that trust even further. But from that point on, her every effort goes towards genuinely trying to make amends. She puts her life at risk repeatedly and sacrifices her beloved singing voice, all for the hope that she can undo the damage she caused. She brings him flowers to cheer him up, knowing his love of their scent. It’s noteworthy that it’s not till very late in the game that the wolf utters two small, powerful words: “I’m sorry.” It’s easy to say “I’m sorry”, without really meaning it; you see it seemingly every day on social media, when someone is called out about some insensitive thing they said or did, and their response is “I’m sorry if you’re offended.” A real, honest apology is more than words; it’s action, and that’s something that runs through The Liar Princess and the Blind Prince. Heavy and significant as those themes are, the fairy-tale setup and presentation grounds them in something familiar and approachable. This isn’t some dense dissertation, useful though such things are; it’s an interactive picture book, full of charming hand-drawn art and simple yet captivating prose. It’s Beauty and the Beast by way of the Brothers Grimm, but underscored by a melancholy hopefulness that belies the Grimms’ morbid sensibilities. 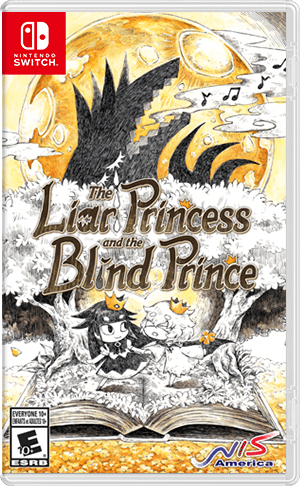 It’s this fairy-tale framework that allows The Liar Princess and the Blind Princess to cut right to the crux of a complex theme where other games would get lost in the minutiae. It’s a story of love, of friendship, of hope. It’s a story about trust—trust given, trust earned, trust lost, and trust redeemed. Most of all, it’s a story about the power of two little words when they’re delivered with all the meaning they deserve.